It was seriously quiet for black folk on Raw this week (and every week? ), but something amazing did, in fact, happen. Now I saw some other outlets getting huffy because "oh, it's the 'put all the black guys on one team'" gimmick, and usually this would piss me off, but it's not that far out of line. It's not like there hasn't been beef between Elias and Titus WORLDWIDE over the last few weeks. 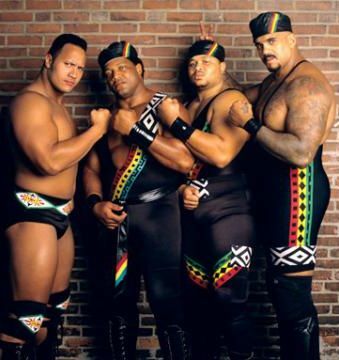 And hell, any time I can see three black guys win a match on Raw? Here. For. It. Plus, it's better than some black-on-black crime, which we'll get into a little later. Hell, we might even see Jordan joining WORLDWIDE! I can't front; it's hard to get excited for 205 Live. That said, I'm not mad at this match, primarily because we got to see Cedric and Rich Homie Swann buddied up. I don't know or can't remember why this is a feud; it has something to do with Fox feeling disrespected last week when she lost. Whatever, it's happening, and even though the obvious is occurring (Sasha winning, duh), it looks like this must go on. That's all the black folks for this week on Raw. For the full details on this week's Raw, check out WWE.com.